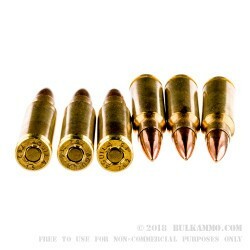 A solid shooter grade round for sue in any .308 Winchester rifle, this good quality ammunition is a perfect choice for those who need more .308 but cannot justify the high purchase price of the premium rounds and can’t find the lower priced mil-surplus rounds. It’s a very good quality round for those who understand the limitations of budget .308 ammunition. 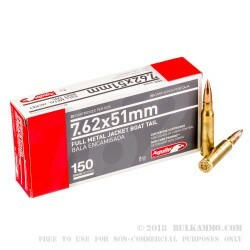 It’s not the cleanest ammo in the world and there are times when this round won’t like a certain type of firearm as well as it does others, but overall, this is a great bargain for those who aren’t using it in a mission critical situation. Not that it couldn’t be used that way, it just wasn’t designed to be used in situations where you need top tier ballistics or top tier tolerance control. 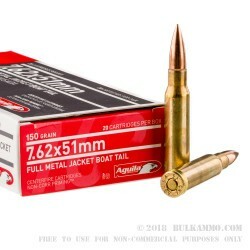 It’s exceptional ammunition for when you need to put lead down range and ½ MOA isn’t a requirement. For when you want to get on target for scope work, but don’t want to spend $2 a round to do the basic work. It’s a perfect companion for when you need to put the hurt on some steel targets, or test your tactical shooting skills in your lightweight AR10 or Springfield Scout, or any other tactical rifle in .308. We'll is like -10 this week so I don't think I'll get a chance to shoot this anytime soon. Came heavily packed, and fast as always from BA. they ammo looks stellar. Nice and clean. For when it was on sale,this stuff looks to be a steal! I'm sure the will be great for the range to get my new .308 scoped in.